I told ya I was thinking about waffles yesterday. So when I woke up this morning breakfast was an easy choice – WAFFLES! 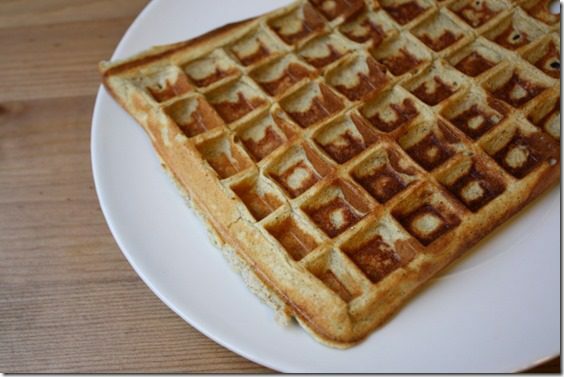 It’s been a long time since I’ve made waffles in my waffle maker – throwing a frozen one in the toaster oven is just so easy! 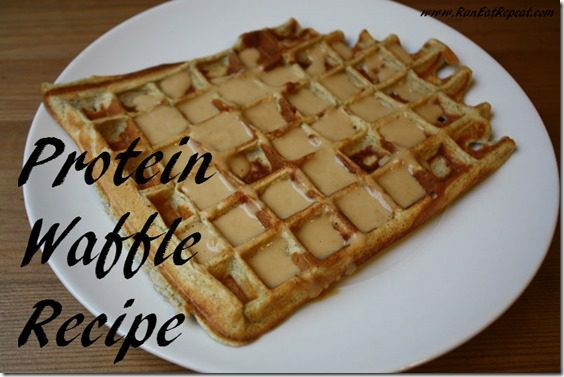 But, I wanted a fresh one and threw together a protein waffle recipe from memory. Remember when the blogworld used to make protein pancakes and waffles every Sunday? Oh, the good ol’ days. Luckily, it’s back! Serves one. Gluten free. Protein full. Directions: Heat waffle maker and spray thoroughly with oil or non-stick. Mix dry ingredients. Add wet, mix. Pour on waffle maker and cook until done. Don’t check it too often. I let it cook for a good amount of time before I peek, but my waffle maker is old school. Top with syrup, peanut butter, sardines, whatever you like. 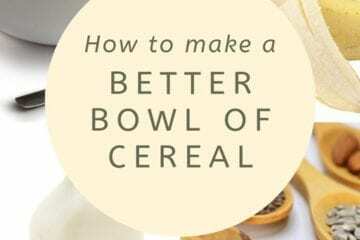 How To Make A Better Bowl of Cereal– Healthy Breakfast Tips! One REALLY cool trick is to whip the eggs by themselves before adding them to the batter. This will help make them a bit fluffier like traditional waffles! Love the website! Thank you for the recipe! I made mine with chocolate protein powder and topped with jelly and syrup (oh, the sugar). 🙂 they were delicious!! This recipe was amazing, fulling. I love waffes but stopped eating when I changed to a cleanier, healthier diet. These are perfect to help me meet my goals w/o eating tastless items. This will be a regular meal. So easy, quick, and afforable to make. Thank you. Thanks for the great recipe. I’ve been looking for something to fool myself into feeling like I’m eating normal food – only so many protein shakes and egg omelets you can eat for breakfast. The batter was extremely thick and I was sceptical even as I was pouring it into the waffle iron, but it came out just fine. It wasn’t crispy but the flavor was good. The only thing is it was a bit dry. Any suggestions on getting it more moist but not soggy? Waffles or pancakes? DON’T MAKE ME CHOOSE!!!!!! 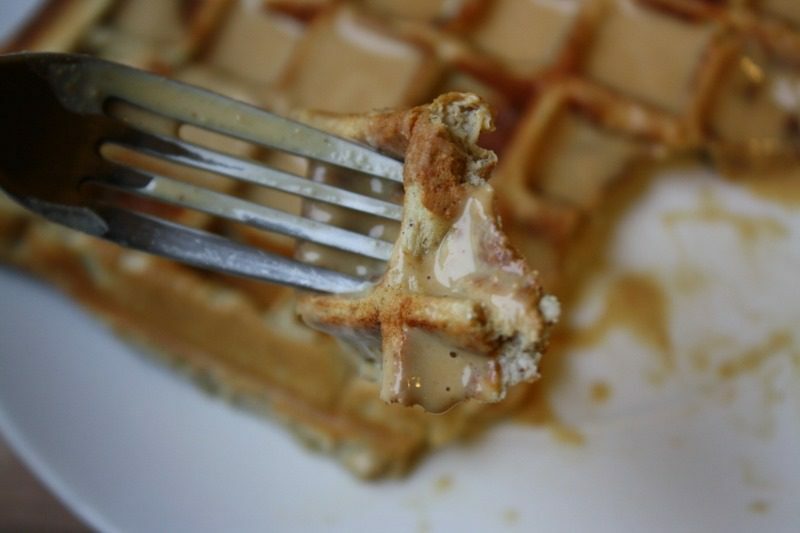 Waffles, and my favorite toppings are applesauce and peanut butter together. Or, if I have found it on sale, apple syrup. YUM! I think you should top it with oysters. However, I will be making this! It sounds and looks amazing! Waffles! I forget sometimes that it really isn’t THAT hard to get the waffle iron out of the cabinet to make them homemade. But if laziness didn’t win so much of the time, they wouldn’t be a special occasion food, would they? Pancakes- but only because we don’t have a waffle maker. Hmm, maybe that’s what I need for my birthday… looks delish!! I don’t wanna choose between the two but they’ll definitely have maple syrup and peanut butter or sorbet on top! I just used my new waffle maker for the first time this weekend and am in love. I love waffles with peanut butter and maple syrup. So good! that looks amazing. i am a waffles person all the way. No! I ate them all before I used it for waffles. Boo. Homemade waffles with peanut butter and real maple syrup is the PERFECT way to start any day. My mom makes the fluffiest belgian waffles and I can eat them until I’m stuffed! 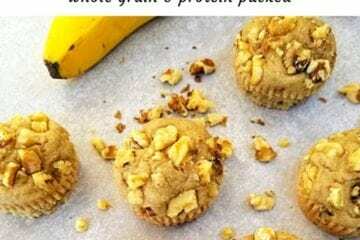 The fact that these are gluten free and full of protein makes them a healthier option for days when I’m busy and active. I need to get a waffle iron so I can try these out! waffles!!! so crispy, and perfectly paired with some nut butter… i love the crunch! this looks so yummy and easy! I think I actually have all the ingredients too! Can I make as a pancake tho? I don’t own a waffle maker (tragedy, yes, I know). Yes, it doesn’t have that crispy waffle consistency so it would probably be better as a pancake! Ooh these looks delicious! I am so bad about not eating breakfast and these are making me want breakfast bad especially after my long run earlier! 99% of the time it’s waffles, but once in awhile I get massive cravings for chocolate chip pancakes. We have a local hole-in-the-wall breakfast place that has a TON of each- perfect after a long morning bike ride. Oh man! Pancakes OR waffles? How bout both 🙂 I’ve been looking for a recipe that using protein powder and these fit the bill! Thanks! Happy Sunday and God Bless! My husband and I were just talking about what to have for lunch. I really want breakfast now. We don’t have a waffle maker so we will have to settle for pancakes. Yum! Pancakes, but only if they have chocolate chips in them. I also love a good hotel-style Belgian waffle, but it must have peanut butter in every single little pocket. Now I’m hungry. That waffle looks delish! I’ve made quark pancakes for the first time today, and they were pretty good, even if I do say so myself! Waffles! I like to think those little squares allow for maximum topping storage (it’s science). 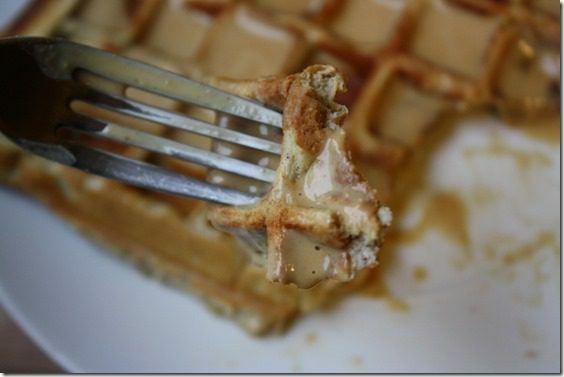 This recipe looks much better than the Eggos I have in the freezer!